These are the three cornerstones of the Society of St. Vincent de Paul. If you are interested in serving those in need within our parish boundaries, and putting your faith into action, please join us the first Monday of the month at 7:00 p.m. in the Gathering Area at Our Lady of Fatima to learn more about the work of our conference. A little time and a caring heart are all you need. The St. Vincent de Paul Food Depot is in dire need of paper products! The State Bridge Cards given to our clients cannot be used to purchase paper products. All of us can appreciate how necessary these items are to a household. Please cut coupons, watch the sales and donate whatever you can. Your donations may be placed on the table in the nook of the Fatima Gathering Area or on a table in the back of the Church at St. James. Your help is needed and deeply appreciated. Thank you all for your generosity. The fundamental elements of the Society of St. Vincent de Paul are Friendship, Spirituality and Service. It is the aim of all Vincentians (members of the Society of St. Vincent de Paul) to continually grow in these area. Membership is open to all individuals who desire to help those in need and want to follow the spirit of the founder, Blessed Frederic Ozanam and the Vincentian’s patron and namesake, St. Vincent de Paul. 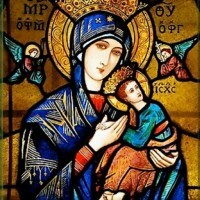 The Our Mother of Perpetual Help Society of St. Vincent de Paul Conference provides critical support to the residents within the boundaries of our parish (Oak Park, Ferndale, and Royal Oak Township). Through their hands-on charitable work they are a vital part of the community, offering food assistance, emergency support and relief services to help enhance the lives of the less fortunate in our area. The Conference meets at 7:00 pm on the first Monday of each month in the Gathering Area at Our Lady of Fatima Church.